This is our first responding unit to structure fires within the Village limits. 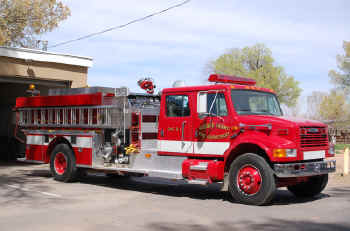 It has the capacity of pumping 1000 gallons of water a minute, can pump Class AFFF foam, is equipped with breathing apparatus and can transport 5 fire fighters. This is an assistant unit to Unit 5-1 as well as the first responding unit to vehicle fires, rescues and mutual aid fires to Peralta. 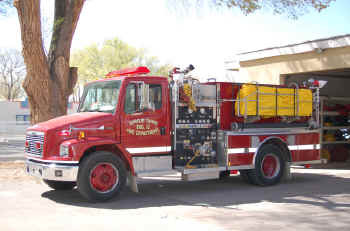 It also has a pumping capacity of 1000 gallons per minute, can pump Class A foam and transports 3 fire fighters. The main responsibility of this unit is to transport both personnel and supporting equipment to the fire scene. This truck carries 6 personnel, Extrication equipment, Generator and Scene Lighting. 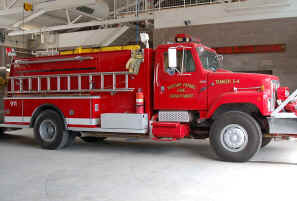 The newest addition to our fleet is this tanker. It was purchased in the Spring of 2006 and has been modified to meet our needs. 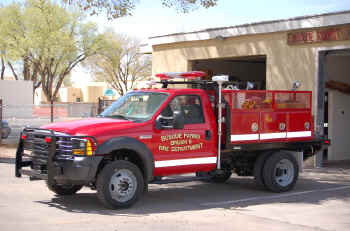 This unit sees most of its action early in the year with brush and river fires that are common in our area of the bosque. 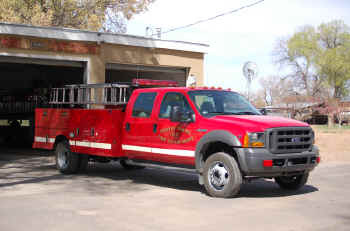 This truck has a slide in Unit with a 250 a gallon tank and a portable pump for drafting from alternative water sources.